113 mm/45 Mk IV2 х 2 / 1 х 1 pcs. Initial HE Shell Velocity746 m./s. Initial AP Shell Velocity746 m./s. 533 mm PR Mk II2 х 5 pcs. 113 mm/45 Mk IV2 х 2 pcs. 113 mm/45 Mk IV3 х 2 pcs. 40 mm Bofors Boffin2 х 1 pcs. 40 mm Bofors Mk V1 х 2 pcs. 40 mm STAAG2 х 2 pcs. 40 mm Bofors Boffin3 х 1 pcs. 40 mm STAAG1 х 2 pcs. Jutland — British Tier IX destroyer. One of the Battle-class destroyers. She was designed with consideration of the experience gained in World War II. She had a very powerful anti-aircraft defense due to enhanced AA automatic guns and main battery, which served its dual purpose in full. Jutland is the tier 9 British destroyer and is a development on the playstyle of her predecessor, Lightning in the role of a defensive destroyer. Her armament changes, between two dual and one single 113mm gun mounts on the base hull, and three dual mounts on the upgraded (B) hull. Two quintuple torpedo mounts completes Jutland's offensive armament. One of Jutland's key strengths is her concealment. Her concealment is competitive against ships at her tier, able to compete with even the Japanese destroyers. Captains of Jutland should use this key strength to their advantage. 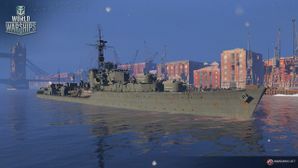 With careful management of her position and concealment, Captains can keep hostile destroyers spotted, and control the engagement choosing when they wish to engage. Her six 113mm guns despite being smaller than her predecessor, are an upgrade in most regards sporting a high base fire chance and fast reload of only 3.5 seconds. The ability to traverse her turrets a full 360-degrees aids her in keeping her guns on target while maneuvering. However, without Inertia Fuse for HE Shells she can only penetrate 18mm of armor, making the skill a must. Jutland's armor-piercing shells also boast enhanced auto ricochet angles, enable her to better deal damage vs angled targets. Her torpedoes armament is also an improvement, now sporting a 10km range and ten tubes combined with a relatively fast reload. Her excellent concealment allows her to lay ambushes against unsuspecting ships allowing her to control the engagement and to make effective use out of her Smoke Generator ( ) and Hydroacoustic Search ( ). Jutland differs from the preceding ships being able to equip a Repair Party ( ) consumable. The addition of this consumable provides her with added flexibility, allowing her to recover some health between repositioning and increases her total potential health. The relatively short smoke screen cooldown combined with an increased rate of acceleration allow her to swiftly reposition and the ability to recover some health compliments her in the role of a defensive scout. Not everything is great for Jutland however, as her lack of the Engine Boost ( ) consumable can slow down her ability to reposition and makes evading combat a difficult task. Because of this, Captains will want to take great care to stay near to their team to have support against any ships which may engage her. Overall, Jutland is a ship which plays similar to the rest of the line, while being in general improvement. Captains will appreciate the improvements over the preceding ships in the line able to perform well in the defensive scouting role. She is a relatively strong gunboat backed up with very usable torpedoes and fans of gunboat destroyers will likely adjust quickly to her playstyle. Excellent ability to start fires with her HE shells. Torpedoes have a fast reload and are stealthy. Ability to single fire torpedoes. Hydroacoustic Search ( ) can keep her from being surprised by torpedoes. Enhanced auto bounce angles increase’s the effectiveness of AP vs angled targets. Heal allows Jutland to stay in the fight for longer. The smoke from her Smoke Generator ( ) has a short action time and smoke duration. The lack of Engine Boost ( ) makes Jutland slow when compared to other destroyers at her tier. No Defensive AA Fire ( ) to increase her AA effectiveness. Requires Inertia Fuse for HE Shells to be able to effectively damage ships. Captains should prioritize unlocking the upgraded hull first as this brings an increase in firepower, survivability and maneuverability. After this, the range upgrade is recommended as the extra range can allow you more flexibility in where you position and who you target. Key skills for Jutland commanders include your standard destroyer skills, Concealment Expert, Last Stand and Survivability Expert. However, to get the most out of Jutland, Inertia Fuse for HE Shells, and Demolition Expert are also recommended. Type 1, 2, or 5 camouflage can be equipped for credits; Types 1 or 5 are recommended at a minimum to reduce detectability range. Players who wish to spend doubloons can equip Jutland with Type 19 camouflage that lowers her detection radius, reduces the accuracy of incoming shells, reduces her repair costs, and increases the amount of experience she earns. Captains should equip combat signal flags to improve the ship's performance during battle. Sierra Mike ( ) is highly recommended for the increase to the ship's top speed. Victor Lima ( ) and India X-Ray ( ) flags can be mounted to further improve upon the ship's main battery fire chance. India Delta ( ) is also recommended to increase the amount of health that can be recovered with her Repair Party ( ). Lastly, economic and special signal flags can be equipped to increase the credit and experience gain of the ship. 260 – 300 officers and enlisted. HMS Jutland (D62) was a later or 1943 Battle-class fleet destroyer of the United Kingdom's Royal Navy. She was named after the Battle of Jutland, the largest naval battle of the First World War. The first Jutland was launched in 1945, but was cancelled that same year. Her sister ship, Malplaquet - named after a battle between Britain and France during the War of the Spanish Succession in 1709 - was renamed Jutland just prior to her launch on 20 February 1946, and was commissioned on 30 July 1947. The original Jutland was finally broken up in 1957 at Rosyth. This page was last modified on 4 January 2019, at 22:07. This page has been accessed 25,003 times.